Well, most young urban professionals have no time for breakfast. Most are too busy sleeping or if you are a REAL REAL REAL REAL YUPPIE, it’s a 6am wake-up call, 1 hr morning yoga session to find your zen to make more $$$, a quick shower + super-fast make-up session to set your face for the day. The most unhealthy yet most popular breakfast item in KUALA LUMPUR is nasi lemak. It’s high in fat and carbohydrates BUT IT IS NOT BANNED like fast food ads may be. Our not too bright Health Minister has proposed to ban fast food ads to promote healthier living!! BUT almost ALL POPULAR LOCAL FOOD are equally bad in terms of calories and evil elements like FAT, SALT and SUGAR. So Chua Soi Lek (our Health Minister), PLEASE WAKE-UP and STOP your pre-general-election SANDIWARA (Malay for “shadow play”)! WE WANT TO KNOW IF THE PRICE of HIV drugs will be affected by the Malaysia-US FTA agreement…..pls come up with a proper STUDY. For more on Nasi Lemak. Read on. 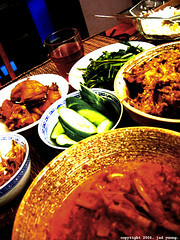 Saturday, 19 May 2006 – Bless her, Hanny cooked Nasi Lemak for Jayna + me for my farewell dinner. She had a full week and a full Saturday, but whipped up an authentic Malay meal with a Northern twist. Nasi Lemak means ‘Fat Rice’ and it does make you fat!! But it really refers to the creamy coconut milk used in cooking the rice. Besides the aromatic ‘pandan’ leaf and ginger, Hanny’s version also had onion slices, which added a crunch to the rice. Her special Sotong Sambal, cuttlefish cooked with chili paste, was perfect. With just enough crunch in the cuttlefish and the sauce was neither too sweet nor too spicy. The Ayam Rendang, a dry chicken curry cooked with shredded coconut, had me wishing that I’d starved the whole week. Jayna couldn’t stop picking on the Ikan Bilis, deep-fried anchovies. Coupled with Kangkung, a local crunchy leafy vegetable, and cucumber, the meal was simply sublime.